In 2013, Guma wrote the piece ‘One-Man Show: What Happens If Bernie Runs for the Presidency?” which tracked his rise from a third party candidate placing in single digits to a major force in state politics and projected a similar trajectory on the national stage. Guma said today: “Many people are now trolling around for dirt on Bernie, but it’s unlikely to stick. … It’s critical to understand that Bernie is not and never was a party builder, he was a candidate. He originally won because of low voter turnout but rose because of increasing voter turnout. “His campaigns in Vermont were based on the same thing as his current presidential campaign: If you repeat a strong core message enough, people will catch on. We ran on the same ticket in 1981 — both he and I were about to run for mayor of Burlington and we decided he’d run for mayor and I’d run for city council. He barely won that election — his first after many defeats — and that propelled his political career. “Power corrupts, but Bernie has become more human as he has risen. He had years with a hand-to-mouth existence — being elected mayor was I think his first real job. “He’s a natural born politician, but not out to build a cult of personality. 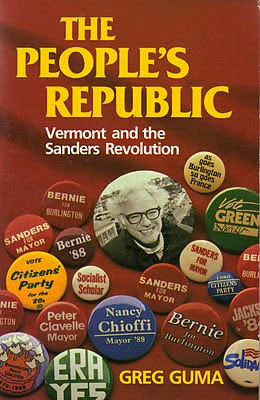 He originally didn’t run as a socialist, but as an independent, which has a strong history in Vermont. And in office he focused on culture as much as anything else — creating an atmosphere of tolerance in Burlington, fostering the arts. “His campaign now is the largest overtly ideological national campaign in a long time and dovetails and contrasts with Trump in many ways. Sanders is an insurgent with the message to the Democratic Party of: ‘we are not of you, but we want to revive you,’ while with Trump, it’s more of a hostile takeover attempt. Trump is saying that Bernie can’t get things done, but Bernie has a certain conservative, cross cultural appeal. He’s gone along with the NRA at times and been targeted by them at times. He talks about democratic socialism, but in concrete terms is really re-asserting the New Deal. He know how to close a deal with the voters and make a deal with opponents. Even though his message is highly aspirational, as a populist, he’s a pragmatist.